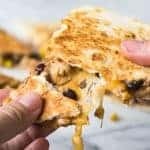 This Cowboy Quesadilla is loaded up with a BBQ Chicken, a black bean Texas caviar and lots of fresh off the block, melty cheese! Perfect for dinner time, this dish will please the whole family! In a medium size bowl mix the cooked chicken with the BBQ sauce until coated. Set aside. In a small bowl add the black beans, corn, diced green chiles, diced jalapeño, red onion and garlic. In another bowl stir together the cilantro, vinegar, olive oil, and honey. Pour the dressing over the bean mixture. Stir to coat. Heat a skillet over medium heat, place one tortilla down on the skillet, layer with BBQ chicken, Texas Cavier, Sargento® Fine Cut Shredded 4 Cheese Mexican, and another tortilla. Cook until the tortilla on the bottom is toasted and turning a golden color, it will start to feel more firm, crispy. Flip the quesadilla over and cook the other tortilla. Once the cheese is fully melted and both sides of the quesadilla are golden brown and crispy remove from the skillet. Cut into 6 equal pieces. Serve and enjoy! Amount of quesadillas made will differ based on size of tortillas used. Cooking time is including time to cook the chicken also.